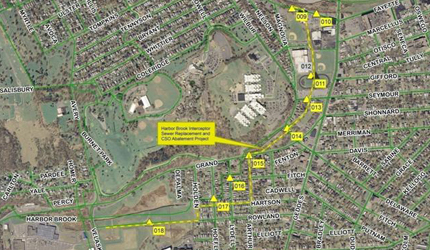 Details: The HBIS Replacement Project provides for a much needed upgrade to the existing Harbor Brook Interceptor between West Fayette Street and Velasko Road on the west side of Syracuse. 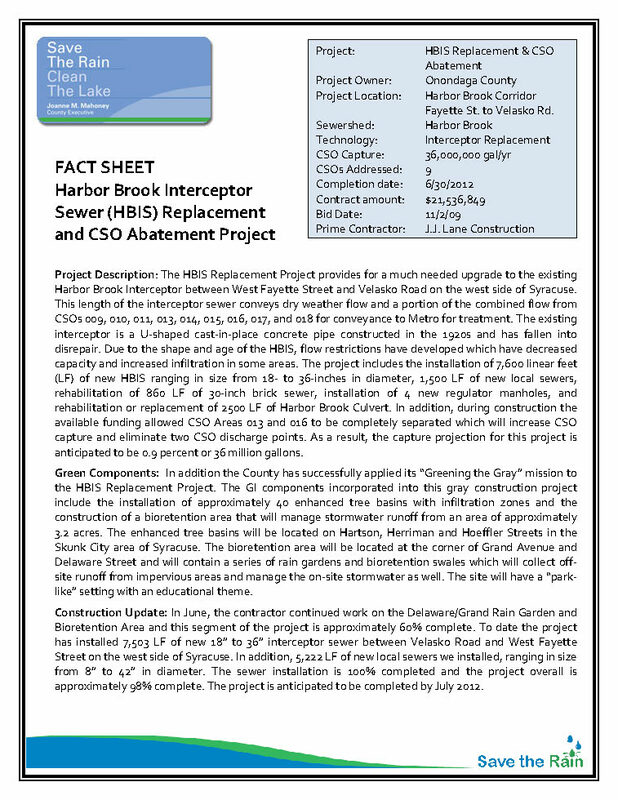 This length of the interceptor sewer conveys dry weather flow and a portion of the combined flow from CSOs 009, 010, 011, 013, 014, 015, 016, 017, and 018 for conveyance to Metro for treatment. The existing interceptor is a U-shaped cast-in-place concrete pipe constructed in the 1920’s and has fallen into disrepair. Due to the shape and age of the HBIS, flow restrictions have developed which have decreased capacity and increased infiltration in some areas. 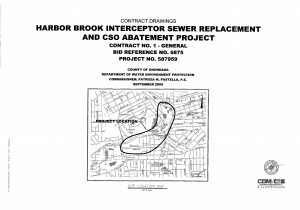 The project includes the installation of 7,600 linear feet (LF) of new HBIS ranging in size from 18- to 36-inches in diameter, 1,500 LF of new local sewers, rehabilitation of 860 LF of 30-inch brick sewer, installation of 4 new regulator manholes, and rehabilitation or replacement of 2500 LF of Harbor Brook Culvert. 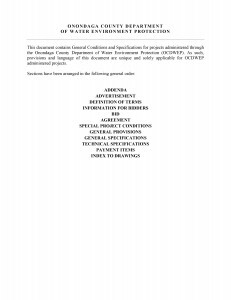 In addition, during construction the available funding allowed CSO Areas 013 and 016 to be completely separated which will increase CSO capture and eliminate two CSO discharge points. 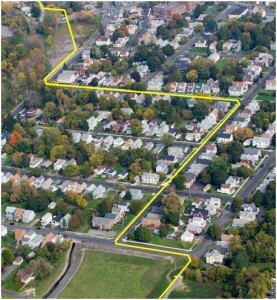 As a result the capture projection for this project is anticipated to be 0.9% or 36 million gallons. Greening the Gray: The GI components incorporated into this gray construction project include the installation of approximately 40 enhanced tree basins with infiltration zones and the construction of a bioretention area that will manage stormwater runoff from an area of approximately 3.2 acres. The enhanced tree basins will be located on Hartson, Herriman and Hoeffler Streets in the Skunk City area of Syracuse. 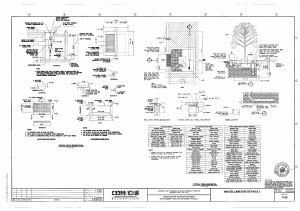 The bioretention area will be located at the corner of Grand Avenue and Delaware Street and will contain a series of rain gardens and bioretention swales which will collect off-site runoff from impervious areas and manage the on-site stormwater as well. The site will have a “park-like” setting with an educational theme. Construction Update (June 2013): In May and June, the contractor completed the installation of enhanced tree basins on Herriman and Hoeffler Streets between Rowland and Hartson, and completed the intersection work at Grand Avenue and Delaware Street associated with the Delaware Rain Garden portion of the project. The project overall is now complete and a final walk through for the Green Infrastructure items will take place in July. 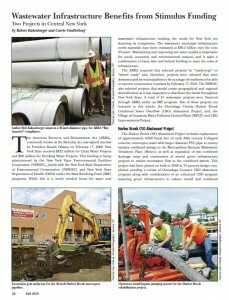 ** This article originally appeared in the Fall 2010 issue of Clear Waters Magazine, the official publication of the New York Water Environment Association.